Silencing extra chromosome in cell cultures could lead to new treatments for the disorder. Individuals with Down's syndrome carry an extra copy of chromosome 21, which causes pervasive developmental delays. The insertion of one gene can muzzle the extra copy of chromosome 21 that causes Down’s syndrome, according to a study published today in Nature1. The method could help researchers to identify the cellular pathways behind the disorder's symptoms, and to design targeted treatments. “It’s a strategy that can be applied in multiple ways, and I think can be useful right now,” says Jeanne Lawrence, a cell biologist at the University of Massachusetts Medical School in Worcester, and the lead author of the study. Lawrence and her team devised an approach to mimic the natural process that silences one of the two X chromosomes carried by all female mammals. Both chromosomes contain a gene called XIST (the X-inactivation gene), which, when activated, produces an RNA molecule that coats the surface of a chromosome like a blanket, blocking other genes from being expressed. In female mammals, one copy of the XIST gene is activated — silencing the X chromosome on which it resides. Lawrence’s team spliced the XIST gene into one of the three copies of chromosome 21 in cells from a person with Down’s syndrome. The team also inserted a genetic 'switch' that allowed them to turn on XIST by dosing the cells with the antibiotic doxycycline. Doing so dampened expression of individual genes along chromosome 21 that are thought to contribute to the pervasive developmental problems that comprise Down's syndrome. The experiment used induced pluripotent stem cells, which can develop into many different types of mature cells, so the researchers hope that one day they will be able to study the effects of Down’s syndrome in different organs and tissue types. That work could lead to treatments that address degenerative symptoms of Down’s syndrome, such as the tendency of people with the disorder to develop early dementia. 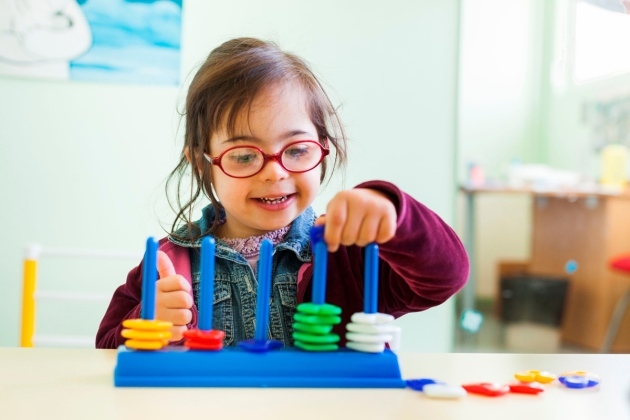 “The idea of shutting off a whole chromosome is extremely interesting” in Down’s syndrome research, says stem-cell researcher Nissim Benvenisty of Hebrew University in Jerusalem. He anticipates future studies that split altered cells into two batches — one with the extra chromosome 21 turned on, and one with it off — to compare how they function and respond to treatments. However, Weiss says that the latest method has its own drawbacks: turning on XIST may not block all gene expression in the extra chromosome, and that could muddle experimental results. Still, Weiss thinks that the approach could yield fresh treatments for Down's syndrome — and prove useful for studying other chromosome disorders such as Patau syndrome, a developmental disorder caused by a third copy of chromosome 13. Jiang, J. et al. Nature http://dx.doi.org/10.1038/nature12394 (2013). Li, L.B. et al. Cell Stem Cell 11, 615–619 (2012). I am a wife, a mother to 2, a professional, and an advocate for Down syndrome. My goal is to balance all the roles I play. Sometimes it even happens. I try to do as much as I can each and every day!